We all have a vision of our ideal kitchen: modern, minimalistic, traditional contemporary, or something completely individual and tailored to suit you. Whatever you imagine, we can make it a reality. We take genuine pride in every boutique kitchen we produce: So from the very beginning we take an intimate interest, carefully choosing the relevant materials, adopting a friendly and open approach from start to finish. We believe that your kitchen should be a reflection of you, your imagination, your home, and your lifestyle. That’s why every one of our projects stems from a partnership between you and our designer. BJF Joinery is a local Joinery company based in Arundel on the Gold Coast. Our talented cabinet makers have over 30 years of experience in residential and commercial Joinery. Call us today to arrange your free quote or visit our New Showroom! Aspire Kitchens is a family owned and operated company based in Brisbane Bayside & Redlands area. We have over 10 years experience in the construction and domestic kitchen/cabinetry industry. Our team expertise includes designing, cabinet making, installation and project management. With continual referrals by happy and satisfied customers, along with our new clients we are looking forward to many more years of success in the cabinetry business. The staff at Aspire Kitchens are passionate about providing a unique and specialised service for each and every one of our clients. Honesty and integrity are important to us as well as our professional attitude. This is also instilled in our professional trades people. Our company designs, manufactures and installs designer kitchens & interior cabinetry for discerning clients. We engage with industry leading suppliers & manufactures. 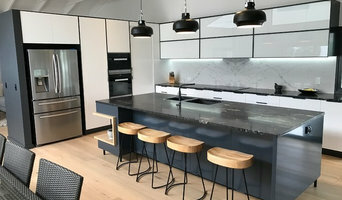 Products including Caesarstone benchtops and BLUM’s high tech drawer mechanisms, soft-close hinges and lift-up systems are incorporated into our designs. Our designs can be as traditional or as contemporary as desired. Finishes can be natural or man-made materials. The use of stainless steel, glass, marble, granite and Caesarstone can reflect the personality and lifestyle of our clients. The kitchen is increasingly becoming the meeting point of choice, because of location in the home and its entertaining potential. That is why the style, functionality and durability of this space is so important. Colours, good design and materials used in construction of your kitchen or bathroom can transform it a beautiful room. That is why Brisbane Kitchens and Bathrooms should be involved in creating the perfect space, which is as unique as you are. Brisbane Kitchens and Bathrooms will work with you to create the perfect bathroom for your home. Our team can combine your ideas into a design plan, creating a practical space that fits your home. We provide simple spaces that are functional, suiting your way of living and within your budget. When you consult with us, we can transform the rooms around your project. 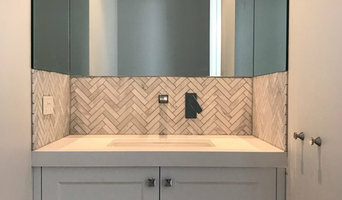 Brisbane Kitchens and Bathrooms are a licensed builder and can re-configure your home to create more space by opening up a wall. We can also move windows and doors, create a bulkhead by dropping the ceiling, have the plumber move pipes or the electrician move fixtures. Everyone is different and so should your kitchen or bathroom be designed to your needs. Brisbane Kitchens and Bathrooms, the complete solution for your home. 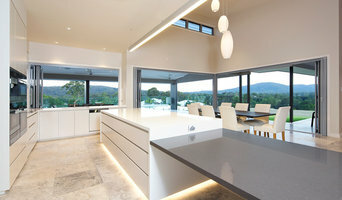 Urban Kitchens and Joinery is an Ormeau based cabinet making and joinery business servicing Brisbane, the Gold Coast and Northern New South Wales, specialising in innovative kitchen, bathroom and joinery design, quality construction, expert customer service and communicative project management. We pride ourselves on our professional, flexible and honest approach, and aim to become your trusted advisor and deliver projects that exceed your expectations. To us, it’s more than just a kitchen or a bathroom, we want to build lasting relationships with every client. By investing the time to truly understand your needs, we provide our clients a tailor-made solution and joinery built to last a lifetime. KSW Renovations is a family owned design and build business on the Gold Coast. We focus on kitchen renovations and we will help you to transform your home with our inspirational kitchens and bathrooms. If you’re thinking about a new kitchen or bathroom, give us a call and we’ll come to your place for a completely obligation-free consultation, and we’ll show you design options that fit with your vision and budget. When you work with us, you’ll see detailed 3D designs of your new kitchen and bathroom before you accept our quote – it’s just one of the things that set us apart from many other kitchen and bathroom design companies. We put the time and effort in because we love what we do and we know that it’s often hard to visualise the end result just by looking at a sketch. 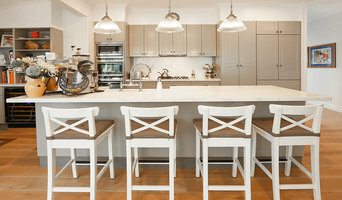 At 'Cut Above Kitchens & Cabinets' we specialise in Kitchen renovation work, offering a tailored service for those looking to make a difference in one of the most important rooms in the house. With our industry experience and knowledge of current trends, we will most importantly, listen and work with you to turn your ideas and dreams into a reality. We take pride in the use of quality products, quality workmanship with a high attention to the detail. Kitchen & joinery specialists with attention to detail and design. From concept to installation, we respond to individual project considerations.